The system consists of the OVIO® profile section and the OVIO® clip. The OVIO® profile section forms the framework that the canvas is attached to. The OVIO® clip makes it possible to stretch the canvas in the frame using a special key. Cut the section to the dimensions of the required frame. Assemble these uprights with the OVIO® joining pieces using a 10 key. In the event of external use, drill holes for draining water in the lower horizontal upright. Attach the frame to the wall or on a pole (see pole guide). N.B. 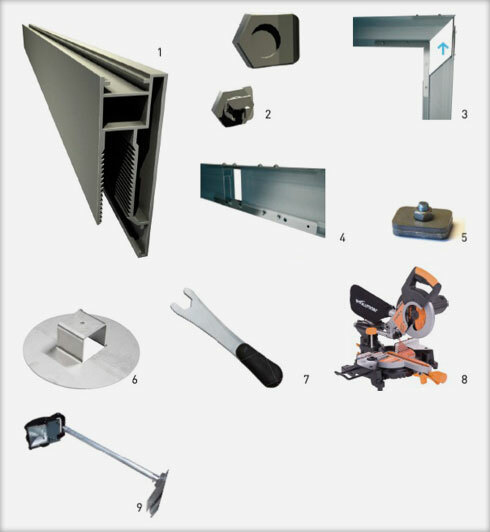 Provide an attachment point a minimum of every 3 metres. The size of the sheet will be equal to the overall size of the frame minus 10 cm. Example: OVIO® frame 5 x 2 m > sheet 4.90 x 1.90 m (including the 8 cm lost edge around the perimeter). The sheet will include eyelets with an inner diameter of 15 mm, every 40 cm around the perimeter. The eyelets will be placed 8 cm from the corners.